Definition of a “Cube”, in geometry, a cube is a three-dimensional solid object bounded by six square faces, facets or sides, with three meeting at each vertex. The cube is the only regular hexahedron and is one of the five Platonic solids. 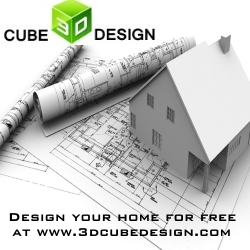 3dcubedesign.com is a free platform created to challenge “Do It Yourself Designers”. This platform offers, to designers, for the first time, a method and a tool to create their own unique house designs. Built around the idea of allowing anybody who wants to design, the ability to design without having to know how to use the professional versions of architectural software. Regardless of your skill set, 3D Cube Design has a simple drag and drop, platform and even the most artistically challenged person can develop their artistic design skills including but not limited to interior, exterior and landscaping ideas. 3D Cube Design may also encourage and enable the creation of compact, economical social housing that does not look like social housing. The use of the site is not limited however, to accomplished designers and serious designs, but may include those, who simply for their own pleasure, will use their imagination to create fanciful and unusual designs.